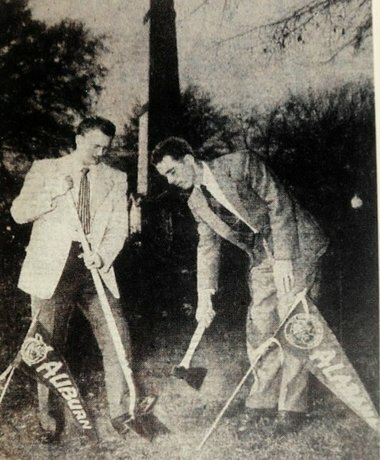 There is a story in today’s Birmingham News on Gillis Cammack (left), who as president of the Auburn SGA in 1948 helped bury an actual, ceremonial hatchet with his Bama counterpart upon the renewal of rivalry with the University of Alabama. I’ve heard the tale, but I’ve never seen the picture. Here’s what Magruder wrote last year regarding digging it up.